We learned something interesting on Friday. 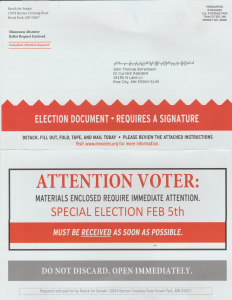 It appears the Rep Jason Rarick’s (R-11B, Pine City) state Senate campaign has sent a mailing districtwide to all of the registered voters. 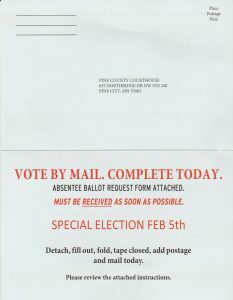 The mailing contains a request form for an absentee ballot. 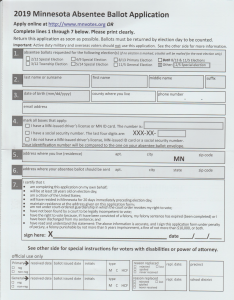 The reason we speculate is because one of the mailers arrived at the door of Legalize Marijuana Now endorsed candidate John Birrenbach (LMN-11, Pine City). See the first photo for the addressee. This doesn’t appear to be a violation of any kind just a service provided by the Republican Party candidate, for which Birrenbach is appreciative. Since both Rarick and Birrenbach are in the southern portion of the senate district we will see how well the legalization issue strikes with the hardline Republican voters, especially those of a more libertarian approach to government. We have included copies of the entire mailing for you to see. Now if copies of Rarick’s Legislative Update appear in the 11A side of the district there might be something worth noting.